Welcome to the last week of The Holiday Cupcake Challenge! We have been celebrating the Holidays all month long with Thanksgiving, Christmas and New Year’s! Our first week we enjoyed Holiday Flavors and then it was all about Thanksgiving! We shared our Christmas Cupcakes last week! When I started planning the Holiday Cupcake Challenge, I tried to come up with a different theme each week. And honestly, I wasn’t really thinking that we would be sharing New Year’s Cupcakes before Thanksgiving. So, I apologize!! If you have a New Year’s Cupcake to share, great! If you still have Christmas Cupcakes you would like to share, I’m opening the Challenge up to include Christmas this week as well!! Feel free to share your cupcake even if it’s not Christmas or New Year’s for Cupcake Tuesday! Quite awhile ago, we made Jolly Rancher Lollipops, so when I saw the idea in What’s New, Cupcake? book to use cookie cutters to mold hard candy, I thought they would be perfect to celebrate the New Year!! Ring in the New Year with New Year’s Cupcakes with Champagne Buttercream Frosting from HoosierHomemade.com. Cover a cookie sheet with foil. Unwrap 4 Jolly Ranchers of the same flavor. Place them side by side like I have in the picture. Note: In the What’s New, Cupcake? book , they crushed the candy before baking it. I wanted the stars to be a little thicker, so I didn’t crush mine. Bake for about 4-5 minutes, watch them closely, because they melt super fast. Heavily spray cookie cutters with cooking spray and push them into the candy. Let it cool until you can touch it. Carefully remove the foil from the back of the candy and VERY carefully break off the excess candy, then remove the star from the cookie cutter. Place them on wax paper (there is foil under the wax paper for the picture). If you have some candy that breaks, like I did, that’s okay, you can still use them by placing that side into the frosting. Beat the butter and shortening until creamy, gradually add the powdered sugar and Champagne until desired consistency. You may need to add a little more sugar or liquid depending on how thick or thin you want your frosting. 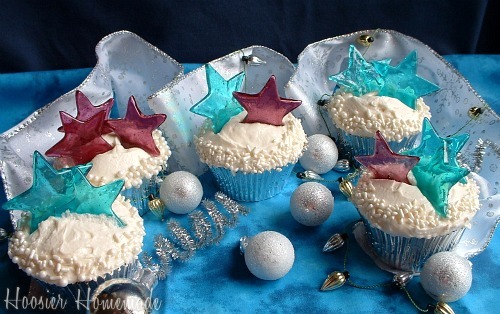 I baked my cupcakes in silver liners to add a little more sparkle! After your cupcakes (any flavor) have cooled, mound frosting in the middle and spread, covering the entire cupcake. Sprinkle with white jimmies and white sugar pearls. Place your stars in the middle. And since we have a little challenge going on, let me update you…our first week Brenna of Ingredients of a 20something won the Holiday Flavor Challenge with her Egg Nog Cupcakes!! She won the What’s New Cupcake 2011 Calendar! The second week was Thanksgiving, today is the LAST DAY to vote!! And ummm…Brenna is winning again!! That is perfectly fine…just trying to get the competition heated up a little! Champagne buttercream? Sign me up! The cupcakes are so cute – you’re so creative with me! I love the red turquoise liners – so adorable and unexpected! I like Sutton Gourmet Papers on Facebook. The turquoise and brown is my favorite! You are so creative!! I love everything, it is so hard to choose. I like the Harlequin in pink and green. Would be perfect for so many occasions or just for fun!